Traveling survival guide to help every musician keep their gear safe and sanity intact. Your big trip is finally here! Metal festivals, concerts, gigs, tours, travels! It’s the best time of year for musicians, and if your instrument is, say, a kazoo, or you sing, life is all good, right? You can transport your instrument anywhere effortlessly. If you’re a guitarist, however, you need to think things through in advance to make sure your travels sail as smoothly as your fingers do during your epic solos. Plan in advance to protect your guitar while you are traveling. At Skonnie, we’ve transported our guitars by air, land, and sea (no joking!) We’ve played concerts and festivals in Europe, haggled with customs in the USA, made albums in recording studios in Sweden, and argued (doesn’t work!) and pleaded (worth a try!) with airline personnel in England. We learned through trial and error, but our guitars have made it in perfect condition through every trip we’ve taken. (Knock on wood!) We’re packing for our next adventure now. Our Skonnie Music guitar cases have been with us all over the world. They show a bit of wear, but the guitars inside are safe and protected. When organizing your trip, one of the first questions guitarists must ask is, “Which guitar am I taking?” If you have only one guitar, the answer is obvious. Some guitarists have dedicated travel guitars where the neck folds for compact portability or ones that are not irreplaceable if they get damaged during the trip. At Skonnie Music, each guitar is special to us and each has a story. The last thing we want is for any guitar to be lost or damaged in any way. That brings us to the number one consideration when traveling: the importance of protecting the guitar in a guitar case. This is nothing to take lightly. It’s totally worth it to invest in a quality case to protect your axe. Are you going on tour? Weekender? Multiple countries? By air? Train? Car? Soft-shell, well-padded cases are great for day-to-day transporting of guitars to rehearsal, band practice, or for short trips in a car. If the trip is by air, or cross-country or continent, you’ll want to opt for a hard case which has a sturdy frame, padding, and a lock. The weight of the case is a consideration, especially if you’re lugging it, along with suitcases, by train or ferry, as we did throughout our Europe trip. You might be surprised by how many sets of stairs there are in European train stations, and carrying suitcases as well as heavy guitar cases can become tiring quickly. On the other hand, you gotta do what you gotta do, and keeping your guitar safe is the top priority. Test your case before you buy, if possible, or at least make sure the size of the case is compatible with your guitar model. Also keep in mind that some cases have built-in storage, which can be great on long trips. We have a variety of cases for our guitars, but we use the hard-shell cases for touring and studio time. Here you see Sal with his Schecter SGR-1C case for his Schecter Jeff Loomis Signature 7 String. It has been from the United States to Europe and back again. It’s survived bus trips, trains from Italy to Sweden, and multiple cross-Atlantic flights with barely a scratch. Highly recommended. The case we use for the Ibanez Steve Vai Jem is an Ibanez hard case. We have a Proel hard shell case for our other Ibanez, and Sal’s Kononykheen Breed Four guitar came with a great soft case. We interchange the cases, depending on our needs and where we’re gigging. In addition to a dependable case, if you’re flying you need to prepare for whether the guitar can go onboard with you, or whether the airline will pull it and put it in the baggage compartment. It’s useful to read and make a copy of the airline’s official policy. Sometimes if you find yourself in a contentious conversation with the gate agent or the crew, politely requesting that you would like it onboard, giving a good reason why may sway them to allow it. Offer a copy of your latest album or a band t-shirt. The gate personnel and the aircraft crew have the power and flexibility to allow the musical instrument in the cabin, so being pleasant works in your favor. Certain airlines like Ryanair allow you to actually purchase an additional seat for your guitar, which you can strap into the seat with a special extension strap the flight attendant will provide. Well worth it for peace of mind. Researching the policy of the airline before you purchase your tickets can save you headaches on your trip. Be careful about connecting flights too. Have your backup plan in mind before you start your trip so you won’t be caught by surprise if the airline changes the size of the plane at the last minute and they insist you check your guitar as baggage. There are pros and cons to each mode of travel that you’ll want to think about when you’re on tour, traveling to a concert, going to a recording studio, on location for a video, or just traveling with your guitar. Flying – Benefit: You don’t have to haul your heavy gear throughout your travel. In general, once you check in, you’re good to go. Con: You might not have control on whether your guitar can accompany you on the aircraft. If the guitar is stored with the checked luggage, it is at the mercy of the baggage handler. You also run the risk of lost luggage (in this case, your guitar.) Temperature changes can cause damage to the guitar. Also, traveling by air with an instrument can be very costly. There is almost always an additional charge, and sometimes weight restrictions. 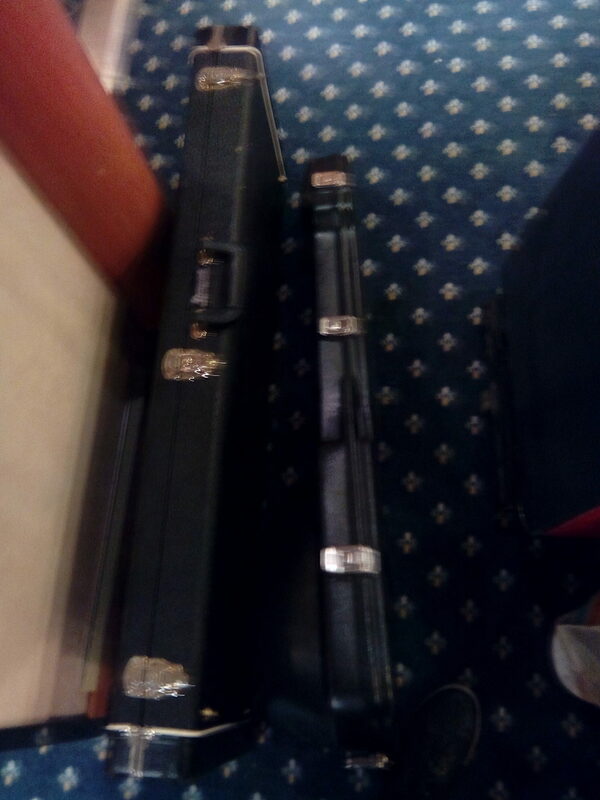 The size of the guitar case must be within the required limits for the airline, and different airlines have varying policies. Bus – Benefit: In general, the amount of luggage you can take on a bus is much more flexible, and weight or guitar case size is not a concern. Con: Guitar will probably be put in the underneath storage of the bus. Once when we were touring up the East Coast, our bus traveled through bad weather and heavy rain. Everything in the underneath baggage compartment was completely soaked when we arrived. Luckily, our guitars were fine. Skonnie Music traveling by train throughout England with our guitars. Train – Benefit: Luggage and instrument policies are very generous. Usually, there are areas in each train for putting your luggage. If possible, keep your guitar with you, or try to store it in a rack over the seats if it fits. Otherwise, definitely keep a very close watch on both your guitar and your luggage. Cons: It is almost always a hassle to carry your gear and luggage in train stations, especially in Europe. There are often stairs (Denmark, we remember you well!) or at least escalators, and lifting your guitar case and bags on and off the train can be a bit tricky. If the train is full you may have a little difficulty finding space to keep your guitar with you. Ferry or boat – Benefit: Easy to bring anything you want. There are not usually restrictions, and you can keep your guitar with you at all times. It’s nice to have a cabin or an assigned seat. Cons: Usually the slowest way to travel. It’s not possible to get to most places by ferry. Sometimes there is an escalator to get to the main boat area, and that can be challenging to navigate with a guitar and luggage, but staff will be on hand to assist. Skonnie Music traveling to recording studio via Ferry, train, airplane, with two guitars, vocal gear, a flute, and misc. equipment. Car – Benefit: You control what you bring, and you can safely pack your guitar. Cons: Works best for shorter trips. Whether you’re on the way to a recording studio to make your album, or your touring, or even just traveling, it’s useful to bring guitar accessories you’ll need. This is especially true if you are traveling abroad or to a remote location. New/Extra sets of strings – if you’re in the recording studio, I can’t stress this enough. You’ll want a new set of strings for every couple of songs. Your recording engineer will probably tell you the studio’s preferences. Take several sets so you don’t find yourself in the stressful situation of scrambling when you need a change or if a string breaks. Purell or similar antibacterial waterless hand soap. Trust me on this. You’ll be happy to have this during every trip for a variety of reasons. Coins in the currency of the country you’re visiting. You’d be surprised how many public restrooms, especially train stations in Europe, require you to have change to put in a coin-operated stile to enter the bathroom. Be prepared and be happy. Cash in the right currency – Not every place, especially outside the USA, takes cards or has an ATM nearby. Even in Europe there are a number of places that expect cash for payment. Hopefully, these tips help you to ensure your guitar survives your journey, and our suggestions make your travels easier and even more awesome. These tips particularly apply to electric guitarists, but they are useful for all guitarists and musicians. See you on the road! What are your experiences with taking your instruments when you travel? Smooth sailing or nightmare stories? Let me know in the comments, and share this post with other guitarists! Subscribe to the Skonnie Music blog for notifications of our new songs and innovative guitar gear. Copyright Connie Yerbic, Skonnie Music, All Rights Reserved.